There are a handful of trees and shrubs that most people – even non-gardeners – feel they know immediately. Holly, that popular plant for the festive season, is probably one of them. Everyone has seem images of this tree, with its iconic red berries in winter, and its glossy, rich-green evergreen leaves, angular in form, with several sharp spines at the corners. Few people realize, though, how vast the world of hollies is, or how diverse. With over 400 species, numerous hybrids and countless varieties, it ranges across all the cooler and subtropical parts of the world, including the Far East and North American, where there are a number of native species. They can be evergreen or deciduous, with red, yellow or black berries. Although slightly toxic to humans, these berries are important food sources for birds in winter. That familiar holly of Christmas cards wreathes and decorations is the European holly, Ilex aquifolium, which is seen growing widely across Britain and other European countries. Deeply rooted in folklore, it was one of the first plants brought over by the settlers, who wanted reminders of home. Sadly, they were often disappointed, because this plant is choosy where it grows, and the northeast and the hotter states were too cold or too hot for it to succeed. There is a middle area where it thrives, but for most people it turns out to be a poor choice. Particularly in the northeast, people valued the traditions of the old countries, and holly was sorely missed. One enterprising lady decided to solve this problem, and at her garden in Long Island, Kathleen K. Meserve set to work. She collected hollies from around the world, and noticed that one, a low-grower from Japan called Ilex rugosa, never died in winter, or even had its leaves turn brown. Inspired, she took some European holly and transferred pollen from one to the other. This gave her hybrid seedlings, which looked more like the common holly, but they were hardy like the Japanese one. She selected some of the most attractive of her seedlings, and one, Blue Girl Holly, is hardy throughout zone 5, and even into zone 4, where it forms a lovely small bush, with darkly colored foliage and attractive red berries. All her varieties contain the word ‘Blue’, so they are easily recognized. 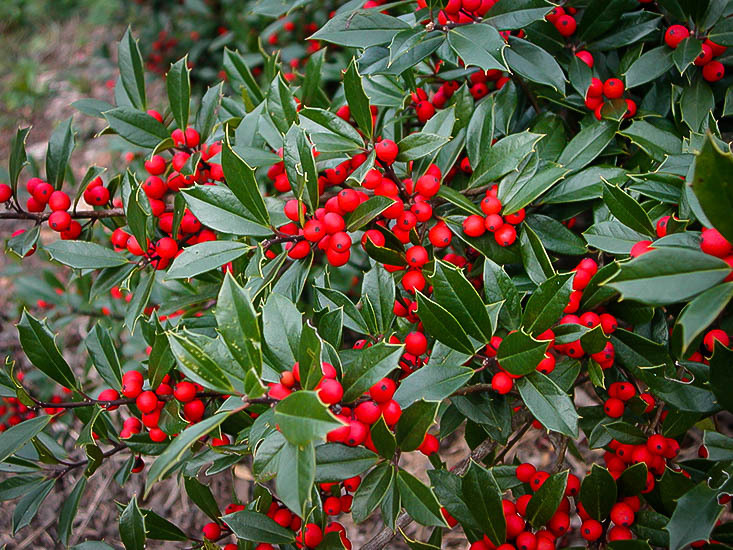 Holly bushes are unusual because male and female flowers occur on separate trees. For good production of berries on female trees, a male tree needs to be growing nearby. So it is a good idea to grow one or two male holly trees in your garden to pollinate your female trees for a bumper crop of berries. Often neighbor’s gardens may have such trees, so in that case you will be fine. If you only have room for one holly bush, and must have a reliable crop of berries, then there is one beauty, the Foster Holly, which reliably carries berries with no male trees around. This tree – shown at the top of the page – has no European blood at all, instead it is a hybrid between the American holly, Ilex opaca, and the Dahoon, a holly from the south, Texas and Cuba, called Ilex cassine. This hybrid is a handsome, upright small tree to 25 feet, hardy throughout zone 6, and every winter your tree will be graced with exactly those red berries we all desire. Turning to something very different, along the stream and river banks of eastern North America, grows the winterberry, Ilex verticillata – a deciduous shrub that many find it hard to believe is a holly at all. That is, until the typical red berries appear on the bare branches as the smooth, spineless leaves fall at the approach of winter. A wonderful shrub for damp soil, it is happy in regular garden soil too. Winterberry takes a couple of seasons to settle in, but then forms dense clumps of upright branches that are a pleasure to see in early winter, and also cut well to bring inside the house. Not all hollies are evergreen, and not all evergreen hollies are spiny, and there are two, one from America, and one from Japan, which have smaller, smooth leaves and make excellent shrubs and informal hedges in partially shaded areas. From southeastern America, although hardy in zone 4, comes the Inkberry, Ilex glabra, usually grown in the form called Compact Inkberry, an evergreen shrub 4 to 6 feet tall. The Japanese species, Ilex crenata, has small leaves almost like boxwood, and its dwarf form, Soft Touch Japanese Holly, deserves to be grown more often as a low informal hedge or edging to beds with larger shrubs. Both of these species are also unusual in having black, rather than red, berries. Finally, another couple of plants stand out for special mention. First is the Oakland Holly Tree, a complex hybrid renowned for its vigorous and rapid growth, making it an ideal evergreen screening plant. Second, for that awkward narrow space where you need some screening that takes up almost no room, the Sky Pencil Holly is top pick. A form of Japanese holly found on the sacred Mount Daisen, this narrow plant will reach ten feet and still be only two feet wide – ideal for tight corners or accent planting. With so much to choose from – and this is just the tip of the holly iceberg – every garden everywhere has room for one or more of these fascinating bushes – a holly in every garden.